2009 is the Year of the Alien, innit? Well, at least in the movies. X-Files producer/director Bob Goodwin goes old-school with his tribute to classic BEM sci-fi with Alien Trespass. Goodwin enlists John "Anubis" Doggett (aka T1000, aka Robert Patrick ) and Eric McCormack (Will of Will & Grace fame) for the invasion, as well as the delightful Jenni Baird, who added a bit of smolder to the last season of The 44oo. I'm sure it's not intentional, but the subject matter and the time period make this a nice companion piece to Kingdom of the Crystal Skull. My biggest role in the beginning was to get a concept based on what Chris had been talking about, and how we wanted to go forward, so we put together the people--the team that were able to do it--and to guide them as to what we wanted. I remember for the look of the show, which in those days was very unique for television, they didn't have shows that had so much dark and light. One of my favorite artists, a guy named Caravaggio, who was probably one of the most innovative and creative artists ever. He came at a time in the late 16th Century, early 17th Century when most art was colorist or mannerist. He was the first to start using real dramatic source light...So I pulled a number of Caravaggio's, I got reproductions of them and mounted them all on a board, and that's kind of where we started. That was the reference of what we're going to go for, from there, the camera, the cinematographer John Bartley and other people were able to at least move forward with the concept. Caravaggio was the Keith Moon of the Italian art world. He ran with some pretty interesting crowds, including the Velvet Mafia within the Vatican and the Knights of Malta. He also was accused of murder and had a knack for fisticuffs. Derek Jarman, the late underground director, directed a kind of biopic on the artist in 1986 that introduced the one-woman Synchromystic factory Tilda Swinton (Orlando, Narnia, Benjamin Button, Michael Clayton) to the world. Amazingly it was also the debut of Sean Bean (Lord of the Rings, National Treasure). The artist is portrayed by Nigel Terry, who portrayed King Arthur in the classic 1981 film Excalibur (which is one of Joltin' Joe Linsner's all-time favorite films). Swinton became Jarman's muse and would later write an essay on Jarman's second feature film, Jubilee, which had John Dee magically transport Queen Elizabeth forward in time to 1977, just in time for QEII's silver jubilee and the Punk Rock Revolution. Incidentally, this was the first feature film soundtrack for U2 producer Brian Eno who would also write the score (with fellow U2 producer Daniel Lanois) for a film on the Apollo moon landing. I always pay special attention to these "firsts." 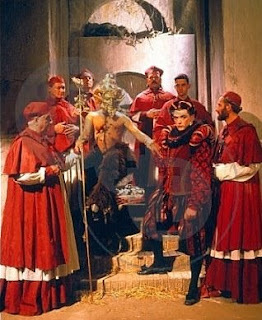 Jarman's first film work was in Ken Russell's religious phatasmagoria The Devils. Russell would later direct Altered States, based on Paddy Chayefsky's must-read book (even though Chayefsky was so upset with the finished product he asked to take his name off the credits). That film would be the first leading role for William Hurt (of Dark City fame) and Blair Brown, who plays a female version of the Smoking Man in Fringe. Speaking of film firsts, Altered States marked the first appearance of Drew Barrymore, who rose to fame in ET, The Extra-Terrestrial. Bob Balaban of Close Encounters fame is also a major player in the film. The basic story is that a Harvard professor believes that genetic memory is stored in the DNA and with the use of powerful hallucinogens and isolation tanks he would be able to travel back in time. The subplot was that he was a religious visionary as a child and lost his faith when his father died, and was trying to reconnect to God ever since. These themes are not well-explored in the film as in the book, taking away the character's motivation. Even if Chayefsky hated it, Altered States is still a must-see. It's fascinating to me that Chayefsky saw fit to write the book after Network, in which he laid bare the depressing reality of the new world order (which isn't really new, seeing that Network came out in 1976- note that it too drinks from Caravaggio's well). In fact, Altered States is the first and only novel Chayefsky ever wrote (which makes him the second most unlikely psychonaut, next to Jack Kirby). He spent two years researching DNA, psychedelics and schizophrenia in order to bring this book to life. From my standpoint it was time well spent, since that book hit me like a freight train when I read it. I even tried an isolation tank, which was a disaster since I kept getting the damn salt water in my eyes. I still think about getting a tank- a good one- if I ever have a few thousand bucks burning a hole in my pocket. That's how hard that book hit me. It's interesting to note that like some more recent apocalyptic fiction, Altered States took place in Boston and had a professor as its protagonist. You see echoes of this in the Revelations miniseries (which also starred Secret Sun siren Natacha McElhone), Knowing, and particularly, Fringe. Fringe creator JJ Abrams (again, the man behind the new Star Trek) has cited States as an inspiration for Fringe, and the Walter Bishop character certainly seems like an older analog of Edward Jessup. And to bring it all full circle, all three of these Altered States analogs were also influenced by The X-Files, which itself was also deeply influenced by Altered States- and Network. The X-Files delved into themes explored in Altered States in the apocalyptic "Sixth Extinction" storyline. In the first part, "Biogenesis," the alien virus in Mulder's bloodstream is activated by exposure to radiation embedding in the rubbing of an alien spacecraft (that incidentally is an encrypted magic square). The rubbing was the property of a Dr. Sandoz (heh), highly appropriate since it ultimately activates the deepest recesses of Mulder's brain, making him psychic and immune to the coming viral apocalypse. The storyline also reintroduced the Navajo shaman Albert Hosteen, who had performed the Blessing Way ritual when Mulder was nearly killed in a boxcar filled with alien corpses (in an episode directed by Goodwin). Somewhere, Terence McKenna is smiling. I've written on this storyline several times, since not only does it involve shamanism, psychedelic experience and ancient astronauts, it also began the Isis-Osiris symbology that I cut my Synchromystic teeth on. It's also going to be reintroduced to the movie-going public this spring when the next Transformers movie comes out, featuring Indiana Jones, Jr. It's all too much sometimes. These strands of meaning weave in and out of seemingly-unconnected phenomena and create their own meta-narratives, which in turn reveal deeper levels of meaning to those who bother to pay attention. And the strongest connections always seem to coalesce around the same memes- gods, aliens, and shamanic experience.